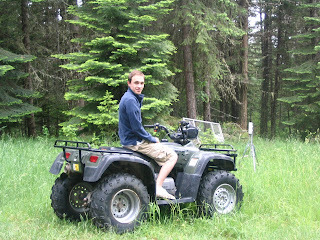 Jacob's brother John has moved to Idaho for the month of June. We had a window of time before my new job (another story) so we drove 10 hours to the family cabin. (Yes, TEN HOURS) The cabin is in Kooskia: population 600. Apparently, it is a rite of passage to get into the Benson family. I suppose mine is almost 2 years late. Better late than never, right? 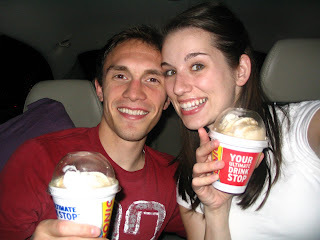 Here we are getting FREE rootbeer floats at Sonic in Boise. We're so cool. Or just really nerdy. The cabin is literally in a forest and now houses some things that have become forgotten. Such as this school bus..... Don't you worry- the Benson family rode in this baby cross-country. It has bunkbeds, curtains, and a would-be toilet. It is probably my favorite (and Jacob's least favorite) memory. Our niece Piper playing in the mud. 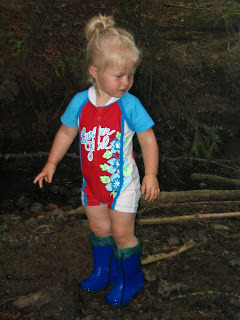 I just love her swim onesie and galoshes. 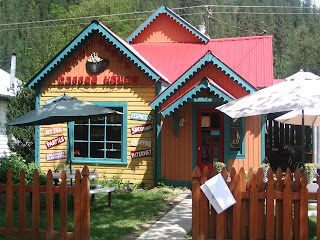 We ate at a cute little restaurant called the Chatterbox. It was great to find a cute hide-away eatery. 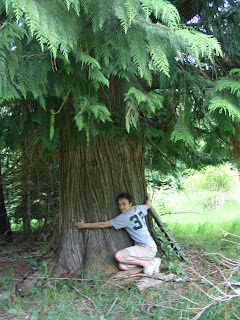 This is a cedar tree that Jacob really loves. Honestly, he talked it up so much that it was a bit anti-climactic. In retrospect, it is really huge. Here is the only place to buy anything in Kooskia. It is about a 25 minute drive into town and you can spend only 5 minutes there. They recently changed the name but we call it Forever Pankey's. Because we can. 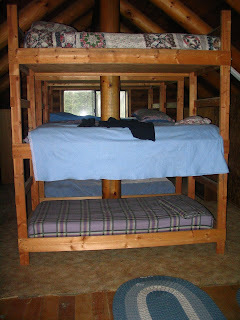 Another favorite: they have 3 person bunks. And they have 3 of them. What a way to maximize space. 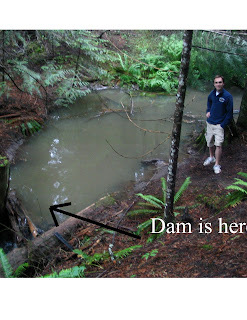 This is the dam that the boys made. It used to be a small stream but they built a damn good dam. 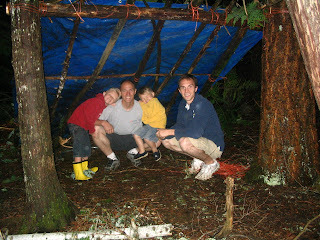 Another big part of the trip was building a fort in the forest. We used a tarp that they boys had used 17 years ago. Yes, Kooskia preserves everything. 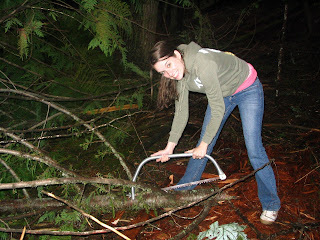 Here I am "helping". I felt it was better to stick to my photo-journalistic duties. Here are the boys in the fort. They hope to picnic in it one time. We tried out a farmer's market in a neighboring town. I was expecting fresh fruit and veggies and some fun homemade goods. It was more like 3 tents with old junk and used puzzles, and one lady selling 3 rabbits and a chicken. I loved it regardless. I will admit that nature takes me out of my comfort zone, but I had a really fun time. Thanks John and Caroline for housing us last weekend! Oh my gosh that looks like so much fun!! So we totally need to hang out sometime, we are pretty free whenever...we are going home over Fathers Day weekend and we might be out of town on the 4th but other than that, we are here and we wanna see ya!! Call me!!! 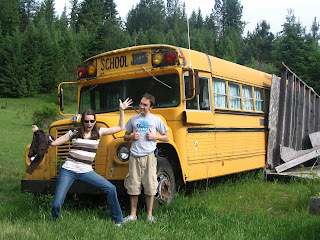 Free rootbeer, yellow bus, triple bunkbeds, forest forts ---- I wanna go to Idaho! Those triple bunks are amazing, you really have to see it to believe it! I also love that school bus, I always wanted to travel in a school bus.